Korvest Galvanisers has won the Galvanizers Association of Australia’s ‘Sorel Galvanizing Award 2013’ for the successful galvanising of structural steel in a number of major railway station upgrades in South Australia. Several rail stations have been upgraded as part of the Adelaide Rail Electrification project by the State Government, with major redevelopments of both the Elizabeth and Munno Para stations on the northern Gawler line. A key focus of these upgrade projects was to develop new stations that created safe, attractive and welcoming transport infrastructure to deliver a user-friendly and comfortable experience. Each station required a fully enclosed pedestrian overpass with lift towers and enclosed stairs, all of which measured 4m x 4m in cross section, and were not conducive to hot dip galvanising. The challenges posed by the design of key components were identified and overcome through consultation with all stakeholders during the design and fabrication process. 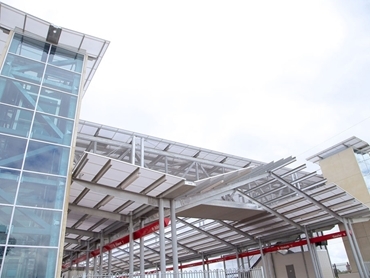 A total of around 850T of steel was hot dip galvanised at Korvest’s Adelaide facility including all structural steelwork for the butterfly roof platform canopies, the fully enclosed pedestrian overpasses, lift towers and enclosed stairs, as well as ancillary steelwork including sign gantries over the rail tracks, lighting towers, bike sheds and decorative screens. Once fabrication commenced, Korvest Galvanisers was in constant contact with the fabricators, particularly with respect to the draining and venting of the large RHS frame segments for the pedestrian overpasses, lift towers and access stairs. These rail stations demonstrate that it is not always possible to break components down into single dip sections, but if all parties embraced the use of double dipping, the long term benefits afforded by hot dip galvanising can be realised.